In the spring of 2006 a four day international workshop was held in Lunteren, The Netherlands, in honor of the formal retirement of Prof. Henny Lamers. These proceedings provide a comprehensive overview of mass loss in massive stars and of the dynamical fate of clusters. The dynamical evolution of clusters is affected by stellar winds, mass loss outbursts and supernova explosions as well as by the loss of stars in dynamical interactions, thus linking the two central themes of the workshop. It is becoming clear that mass loss by radiation pressure on spectral lines is not only at work in normal O, B, and A stars but also in Luminous Blue Variables and Wolf-Rayet stars. The importance of these line-driven winds relative to outbursts in the Luminous Blue Variable phase of evolution is under debate. A central issue in this discussion is the importance of small and possibly large scale structure in stellar winds and its implications for the measured mass loss rates. 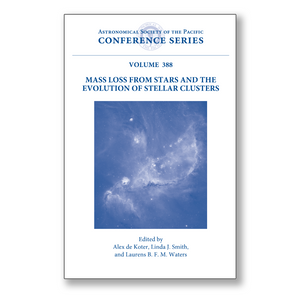 These proceedings report on progress establishing wind properties, on theoretical predictions of mass loss and wind structure as a function of stellar properties, and on the effects of mass loss on the evolution of massive stars. As a result of dynamical interactions, clusters may dissolve completely over time. Observational studies of cluster dissolution timescales as a function of cluster formation history and cluster and environmental properties, are at the focus of cluster studies in the last decade. A key topic discussed in this book is whether the old globular clusters we observe today were once similar to present-day massive young clusters. The mass function of the two types of clusters is observed to be different. Is this a result of dynamical evoltuion or were the mass functions different at formation? The 12 invited reviews, 18 contributed talks, 48 poster papers, and two discussion sessions combine to provide and in-depth assessment of both observational and theoretical issues. The book is suitable for researchers and graduate students interested in stellar astrophysics and cluster dynamics.